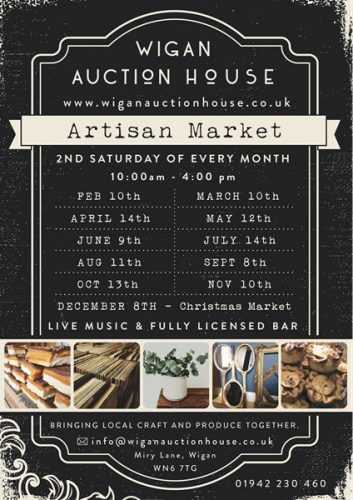 Wigan Auction House on Miry Lane Wigan has announced a new monthly market day on the second Saturday of each month from 10am-4pm. The artisan market promises to be a unique shopping and trading experience with stall holders selling organic meat and dairy, homemade artisan pies and cakes, arts and crafts, bespoke handmade children’s’ clothes, vintage traders, vinyl records and more. Expect rare vintage finds, handcrafted gifts, tasty food, a licenced bar, live music and lots of friendly faces! PLUS it’s all under one roof so we don’t care if it rains! Where about's is the Auction House? Twizz your mouse cursor around to see the location. Thank you, it's the old Wigan Cold Storage place. @Joseph wrote: Thank you, it's the old Wigan Cold Storage place. It wasn't on, my daughter went and said it was closed gates were locked.